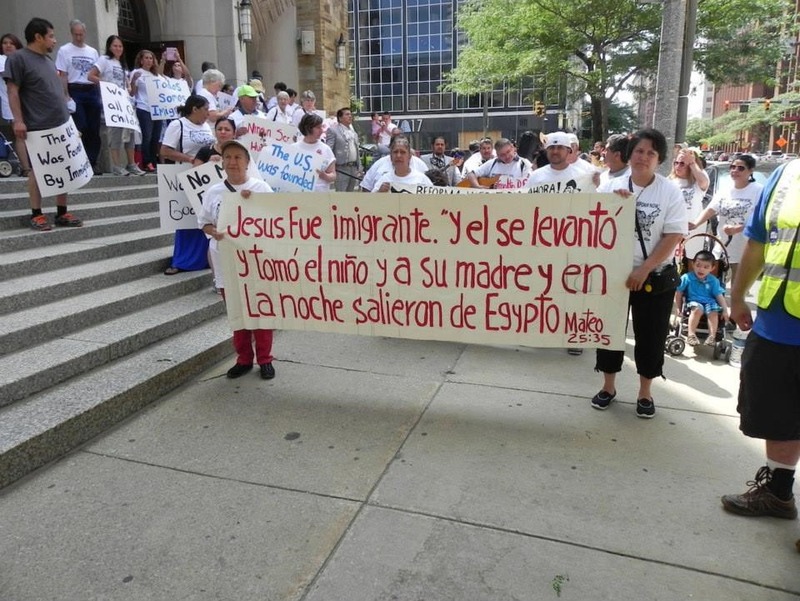 On Saturday, July 12, some 500 people took part in an ecumenical Walk for Justice March in downtown Cleveland. The purpose of the march was to call attention to the need for immigration reform. A prayer service at St. John the Baptist Catholic Cathedral preceded the march. I had the privilege of preaching the homily at the service. In response to several requests, I am posting my homily below. Other sites that may be of interest are: 1) a summary of the day’s activities on the Dominican Sisters of Peace web site, which you can read by clicking HERE; 2) and on the Diocese of Cleveland web site from which you can link to a gallery of photos, see by clicking HERE. Grace and peace to you from God the Father Almighty and our Lord and Savior Jesus Christ. Amen. As we just heard in our Gospel reading, the question is taken from Jesus’ encounter with the lawyer who and asked Jesus what he must do to inherit eternal life. It is helpful to stop and reflect, as Christians, what our faith has to say. The person in need is our neighbor, to whom Jesus Christ sends us in response to his love, without regard to any wall of separation. Our faith raises questions about our American standard of living in contrast with poorer societies. When we react with fear to the presumed threat of immigration, we must ask ourselves what exactly is being threatened. Is it our life or our luxuries? God’s gifts to us in this country have been abundant. Yet even while we celebrate those gifts, we are entrusted with our stewardship of them, our management of God’s resources. We continue to trust that God provides the resources for our service in Christ’s name. God’s gifts are sufficient to carry out God’s purposes. It is possible that questions raised about immigrant issues have a deeper source than we are willing to admit—not our needs, but our wants and desires, which lead us to be centered on self. Our faith asks us to search our hearts for our inner motivations, keeping in mind the danger of turning God’s gifts into idols. We can enjoy them, but not make our life dependent on them. Because we believe that all people are made in God’s image and exist under the lordship of God, our faith teaches us that nations and borders do not claim our ultimate allegiance. Yes, we value the national identity that our borders give us, and we cherish the legal rights and freedoms guaranteed by our Constitution and laws to those who reside within our borders. Yet we know that brothers and sisters who have crossed our borders without authorization are fleeing from desperate situations, from grinding poverty that threatens the lives and health of families. Many die in pursuit of the dream of a new life. More than 52,000 children, mostly from Central America, have arrived in the U.S. since last October, unaccompanied by an adult, in order to escape war, famine and violence. Families are separated in the midst of migration patterns. From a faith perspective, compassion compels us to see these children, not as a illegal or undocumented immigrant—terms which I find equally offensive – no, compassion compels us to see these children and all immigrants as a brother or sister made and loved by God. The Bible abounds with stories of immigration. We could call it the ultimate immigration handbook. We know the stories well. From the very beginning we hear accounts of people moving from one place to the other, some with no known destination. Welcoming the stranger is the central theme of biblical hospitality. It is an inclusive hospitality that always makes room for the stranger. It also shows that no person is to be excluded. Christ calls his people—you and me—to respond to human needs without distinction, not just those persons who share our religious or ethnic ties. “Do not neglect to show hospitality to strangers,” the Letter to the Hebrews tells us, “for by doing that some have entertained angels without knowing it. It is not just the Bible or Christianity but all our faith traditions that share a fundamental belief that human beings are made in the image and likeness of God and that we must treat every person with dignity, for “the strangers who sojourn with you shall be to you as the natives among you, and you shall love them as yourself” (Leviticus 19:33-34). But some have chosen to make it a political issue, driven by divisive ideological views. And so we also gather here this morning in the spirit of our Creator Lord Jesus Christ, not only to remember and reflect on the lives of our brothers and sisters who have either been detained or have died in their search for a better life. We have come here also to ask God for the strength and courage, that God will act through us as we call for justice. We also ask for our Lord and Savior to bestow wisdom on our lawmakers so that they would not shy away from their moral duty and would show compassion to all those that they serve in their bid to create a just, fair and humane immigration policy. Immigration reform is more than a partisan issue, it is more than a political issue, it is more than an economic issue, it is more than a social issue; it is at its core a moral issue. Immigration is not about numbers and statistics, it is about people. Men, women, and children—human beings created in God’s image—who, for whatever reasons, have found it necessary to leave their countries of birth, their families and their familiar surroundings, and go elsewhere. Our struggle is a unified struggle. The parable of the Good Samaritan, as well as other parables Jesus told, teach us to include the poor in our circle of relationships; to be a friend of the poor; to share life with ‘seeming outcasts’. We are challenged to identify with the poor and the loss of privileges and social standing. Upholding family unity; creating a legalization process for undocumented immigrants; and protecting workers, are principles that are rooted in our Holy Scriptures, our faith traditions and our sense of values. God of compassion and almighty wisdom, grant us guidance to carry out your mission by being a voice for the voiceless, a champion for the victims of injustice and a welcoming hand to those who are afraid. Grant us too, O Lord, the vision to see your love and presence in all our brothers and sisters as we seek to create a fair, just and welcoming community. We ask this, O Lord, through your Son, Jesus Christ. Amen. Thank you, Donna! Blessings to you as well.